It's no surprise that I enjoy trail running. 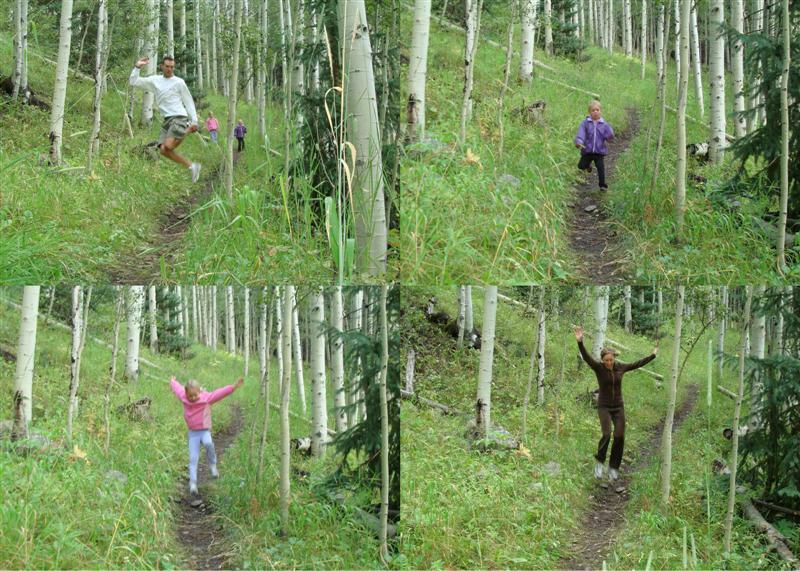 But what could be better than having my whole family share in the trail running love! Little did we know, but a portion of Telluride's famous "Galloping Goose" trail was right behind our campground. Before we left to come home on Monday, we decided to take a family hike on the trail. When we got almost a half mile up the trail, we turned around and ran all the way back down! The girls loved it and were very good about controlling their speed and watching where they stepped. At the bottom there was a little jump in the middle of the trail. 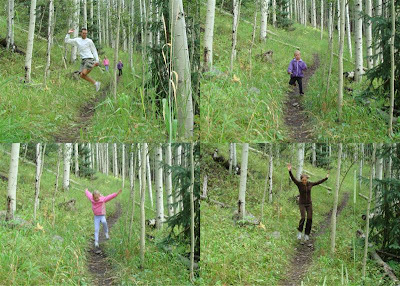 As you can see above, we all took turns launching ourselves off the jump to finish our run! I was dropped off by Tanya at the trailhead at 8:45 am. Assuming the the run would take me a little more than an hour, we agreed to meet two miles down the road at the other trailhead around 10:15 am. 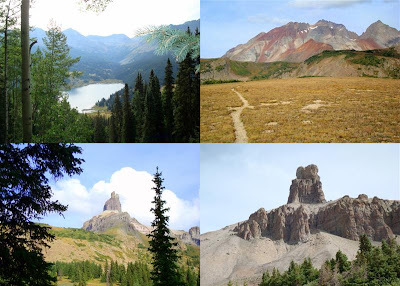 The singletrack trail starts at 10,200' and meanders northeast through an aspen & pine forest for a mile or two, providing sweet views of Trout Lake (top left). 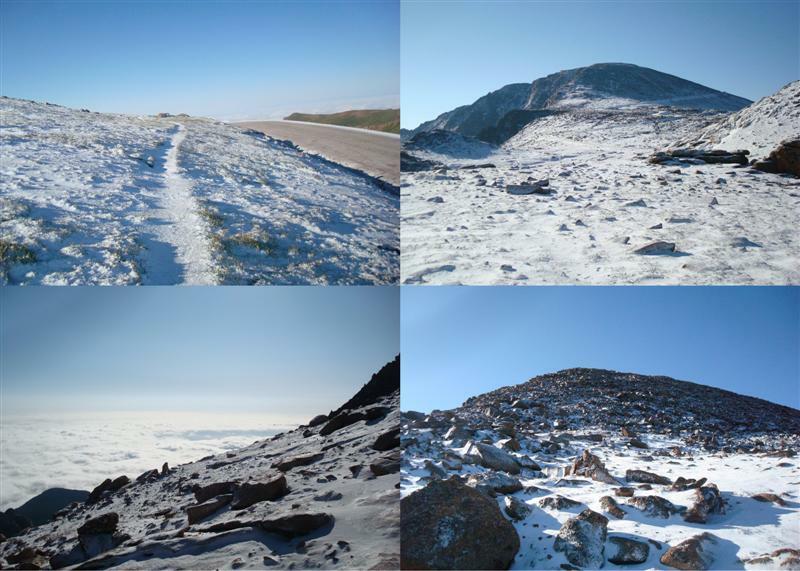 It then turns west and some sharp switchbacks lead you to the summit of Blackface Mountain (12,200'). Blackface (top right) has a long, narrow ridge with a superb trail. Running above treeline provided panoramic views that words can't describe. Looking out at Lizard Head Peak was breath-taking with Gladstone Peak (13,913'), Mt. Wilson (14,246'), and El Diente Peak (14,159') as the backdrop. Actually, it could have been the altitude that was taking my breath away. I started my descent of Blackface while soaking in the views of Lizard Head. After running down through a pine forest and out into an open meadow, I figured this was the closest I'd ever get to it (bottom left). Boy, was I wrong. At this point I was about 5 miles into my run and I was looking for a trail junction that would take me south to the trailhead to meet up with Tanya. Well, that junction never came. The trail proceeded north...and up towards Lizard Head. I thought I missed it so I started to bushwhack my way to another ridge to see if I could see the trail down. I found nothing but wilderness. There was no other trail to be seen. After returning to the trail, I then backtracked about a half mile thinking I surely missed the junction. Nope. My two options were to backtrack my entire run by re-summitting Blackface and then running the extra two miles from my starting point to the other trailhead. Or I could continue towards Lizard Head and hope I miscalculated where the junction was. I chose to continue on. My concern continued to grow as I gained another 1000' in elevation and found myself very close to the base of Lizard Head (bottom right). Lo and behold I came across the junction, now 8.5 miles into my run. Seeing I was already a half hour late from my meeting time with Tanya, I started to cruise down the trail as fast as I could. I finally encountered another hiker and he confirmed I was on the right trail. Phew. Thirty minutes later and 11 miles from where I began, I arrived at the trailhead to find our car...empty. I looked up and Tanya & the girls were about a half mile away...up a different trail. I continued my run for a bit more so I could meet up and enjoy the remainder of their hike! All in all I had a blast. 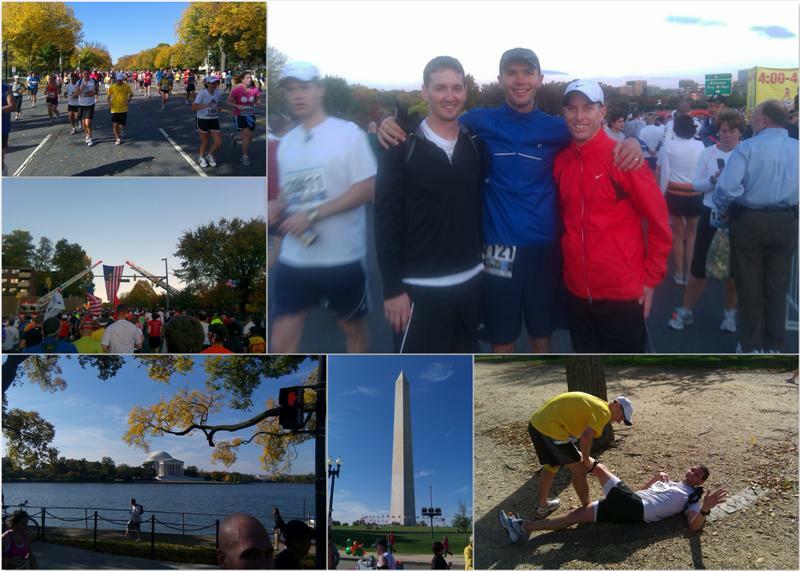 There were a few tense moments, but the memory of such an exciting and beautiful run will last a long time. On Saturday morning, I ran in the Leadville Heavy Half Marathon as a part of my training for the PPM. What is a "heavy" half marathon you ask?? Here's how they describe it on their website, "13.1 (plus a couple more) miles of breathtaking, Leadville Rocky Mountain trails." In total it was about 15.5 miles. Most importantly, it was at high altitude. 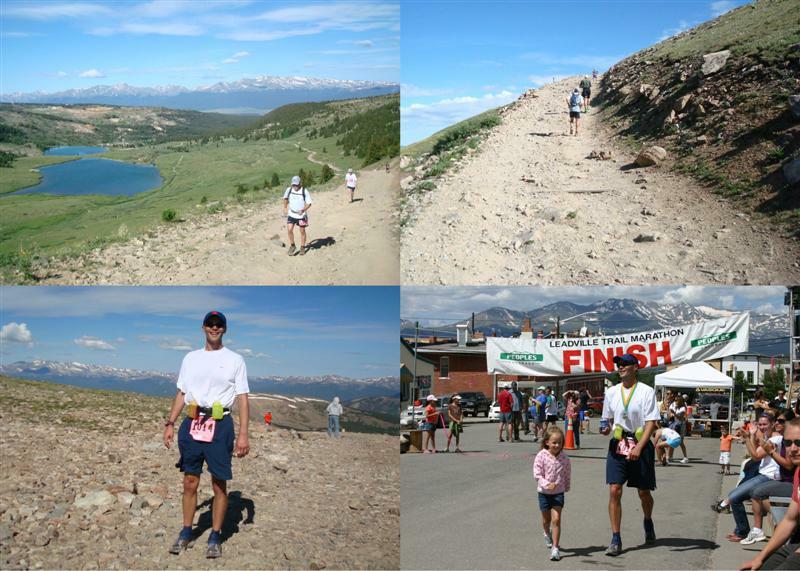 The race began at 10,200' and the turnaround was on top of Mosquito Pass at about 13,200'. This was my first race on trails. Wow, what a difference from a road race. With trail running, there is no "locking into" a pace. No, your pace is constantly changing due to varying factors of trail conditions, elevation gain, not being able to pass on narrow sections, etc. This race was almost entirely on a 4WD only road. It was rugged and steep. Almost all of us were relegated to hiking the last two miles to the top of the pass. Trail races are fairly bare bones when it comes to frills. Let me tell you where they don't skimp. The aid stations. Boy, what a sight it was to approach the first aid station after a grueling 3.5 mile climb. Cold watermelon slices, jelly beans, M&Ms, Coke, Sprite, Gatorade, PB&J sandwiches, pretzels, energy bars...I could go on. I had to remind myself I was in a race and not to linger too long! I went for the watermelon slices and slurped them down with delight! Another first for me? Breaking the tape as I crossed the finish line. Sorry to get you excited, but I didn't win the race. Since most runners were spaced out, they had several young girls hold a tape for every finisher to break as they cross the line. Despite my 25th place finish, it was a nice touch that I'm sure I'll never experience again. I finished the race with a time of 2:53. It's hard for me to think about going another 11 miles, 4000' of elevation gain, and 3 hours on my feet...in about a month. But I was also encouraged that I felt pretty good after this race. Lastly, I want to give a shout out to James, who just completed his "26point2" video masterpiece. It's awesome! Check it out at the link below or on our Videos page. I decided to go for a training run up Mt. Cardigan during our visit to New Hampshire. In training for Pikes, I need to find ways to get in long runs up and downhill. Mt. Cardigan fit the bill except I needed to start about five miles away from the trailhead in order to get in more time on my feet. I began my early morning by parking in downtown Alexandria. The village square probably hasn't changed in 100 years. I proceeded on paved & dirt roads until I hit the AMC Cardigan Lodge. From there the 2.5 mile trail to the summit began. The first half mile was uneventful. Then all the rain NH had received that week reared its ugly head. The trail was a mess. The rest of the way was pretty much what you see above in the sloppy trail photo. As I got closer to the granite face summit, I entered the clouds. The temperature dropped & the wind picked up dramatically. They mark the trail on granite with small spray paint marks. If I didn't have those, I surely would have gotten disoriented and lost. It was a very weird feeling to be surrounded by thick fog on top of mountain. Visibility was about 50 feet. I contemplated turning around, but wanted to find the fire tower, which marked the summit. Slowly, it came into view. 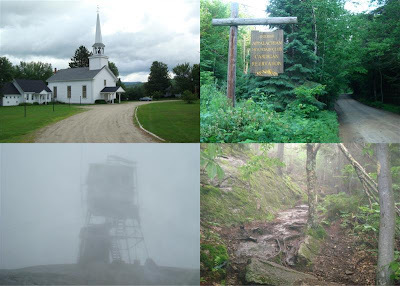 It was so spooky up there, that the fire tower took on a "haunted house" look and I no longer cared to hang around! The run back was nice once I got out of the fog & wind. So in total, I got in about 15 miles and 3000 feet of elevation gain. It was a good run for conditioning my legs. I need to be up at higher altitudes in order to prepare for that piece of the Pikes equation. On August 16th, I'll be heading down to Colorado Springs for what will no doubt be the most challenging running experience of my life. 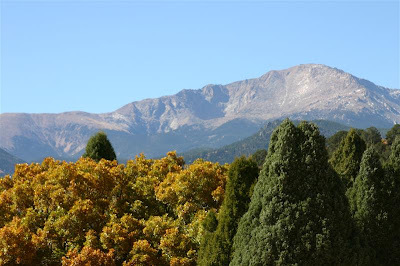 The Pikes Peak Marathon. The mountain is one of Colorado's most famous 14ers. 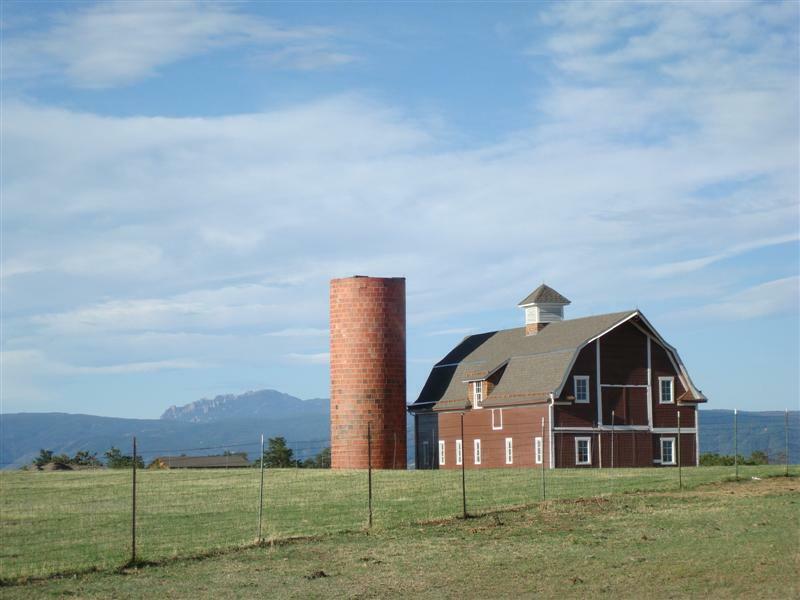 It stands alone and can be seen from all along the Front Range. The race probably wouldn't be that bad if it started up high. No, the start line is in Manitou Spring at 6295' and rises another 7815' over 13 miles. The halfway point of the marathon has you standing at 14,110'...the summit. Then you turn around and head back down. For obvious reasons, this marathon will be quite different than any other I've done. This is not a road race, nope...except for the first mile, it's all on trails. I've read that I should expect it to take the same amount of time it takes me to run a full marathon + 30 minutes...just to reach the summit. Needless to say, this is not a race that will have me running the entire time. Think power walking! You're probably wondering why on earth I would ever want to put myself through the agony of ascending & descending 7815' over 26 miles. Well, I heard about this marathon a few years ago. I went to a trusty source for runner reviews, marathonguide.com, and found the following review titles. "Holy cow, what a great marathon!!" "Even Tougher Than I Expected"
"A must-do for love of running"
I was amazed that everyone who did it, seemed to be in awe of the experience. Many come back to do it year after year. The full reviews can be found by clicking on the link below. In 2008, the marathon filled its 800 spots in 20 minutes. Back in March, I thought I'd try to sign up, but figured I probably wouldn't get in. Well, I did. The race sold out in 24 hours this year. So, I'll be hitting the hills in the early mornings this summer as the shift to trail running is on. No more pounding pavement. 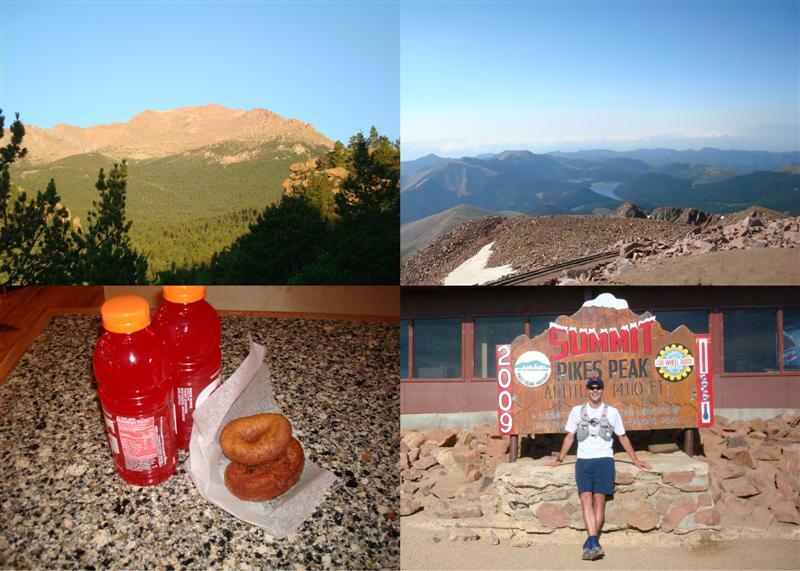 Whatever happens on 8/16, I'm excited to bag another 14er and experience what they call "America's Ultimate Challenge"! When we went to the expo to pick up my packet on Saturday, I was amazed at how big the event was. It took up the entire San Diego Convention Center. After wandering around a bit, I got all giddy when I noticed some familiar faces in the Nissan booth. 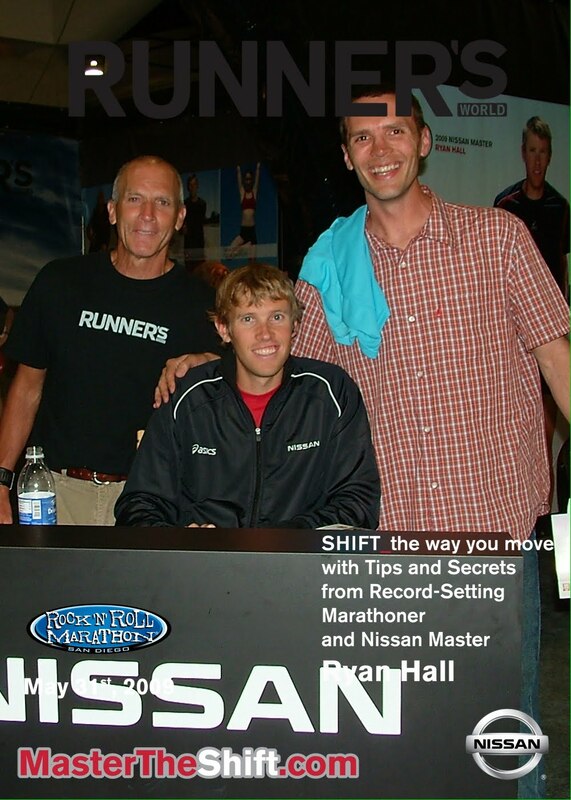 I couldn't resist the opportunity to get in line for an autograph from Ryan Hall and Bart Yasso. You may not know who Ryan is. He recently placed 3rd in this years Boston Marathon. He also holds the record for the fastest debut marathon by an American runner (2007 London Marathon). On top of that, he is the US record holder in the 1/2 marathon (the only American to finish 13.1 miles in under an hour) at the 2007 Houston Half Marathon. Bart, the older guy, is a running legend. He works for Runners World magazine, but it's his amazing running escapades which are chronicled in the book, "My Life On The Run", that have elevated him to legend status. He also invented a training workout called "Yasso 800's", which are a predictor of your marathon finish time. I've been following Ryan Hall since last year's Olympics in which he placed 10th. The more I've gotten to know about him, the more I'm impressed with his character. I finished Bart's book a few months ago and was enthralled with all his stories. Needless to say, it was an absolute treat for me to meet BOTH of them and get their autographs on my race shirt! About a month or two before the race, James emailed me a link to a YouTube video. 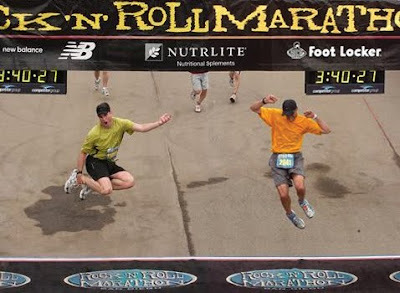 The video was of some guy at a past San Diego RnR marathon that did a flying leap across the finish line. James stated that he wanted to come up with his own version of the flying leap. This shouldn't have surprised me as James is the one who introduced me to 14er leaps. My initial reaction was...he’s crazy!!! He has no idea just how ridiculously heavy & in pain his legs are going to be. Yet, I was supportive and encouraged him to make that decision at mile 26...when he had only .2 miles left in the race. As we approached the finish, he indicated the jump was on. Still dumbfounded...I figured that it would be a great way to celebrate my 8th marathon by trying the unthinkable with him. With about 50 feet to go, we moved into a pocket with no other runners in front or behind us. We gathered a bit of steam right before the line and then launch into our synchronized leaps! Amazingly we didn’t land in a pile of crumpled flesh & bones. No we landed on our feet! It was over! I now look at this picture and have no idea how James was able to grab his legs in mid-air. Incredible. My legs don't bend after running 26 miles. On Sunday, 5/31, I ran the San Diego “Rock ‘n Roll” Marathon with James. It was his first one and let me tell you…he rocked it! The day started by hopping in a mini-van with six other runners including James & his sister Wendi (who was also running her 1st). We were dropped off at the start at 5:00am by Wendi’s gracious husband, Jeff. Right at 6:30am, all 20,000 runners got it going and crossed the start line. The weather was ideal. 60 degrees and very cloudy with a light breeze. The course hits many of the sights in downtown San Diego before cruising north and circling Mission Bay. There were a few hills, but the last 12-14 miles were relatively flat. The bands on the course were great. My favorite was one that was playing Dave Matthews songs. They sounded great! James was our pace setter and we were hitting an 8 min/mile pace for the first 10 miles or so, before settling around an 8:30 pace. What was incredible was that James never slowed down from that pace. He was still hitting it at miles 25 & 26! With a stellar run going, James shattered his goal of a 3:45 by crossing the finish line in 3:38:48. That is an incredible time for a 1st marathon! Oh yeah…check back tomorrow for more about the crossing of the finish line! The picture above was taken at the 10 mile mark. At the top of the biggest hill, we had a big crew of cheering fans to greet us. Tanya & the girls, as well as, Steve, Jennifer, Katie & Andrew all got up early to cheer us on. It finally happened! I'm going to be heading to Boston in April 2010 for the 114th running of the world's oldest and most famous marathon! The Colorado Marathon was a great experience all the way around. 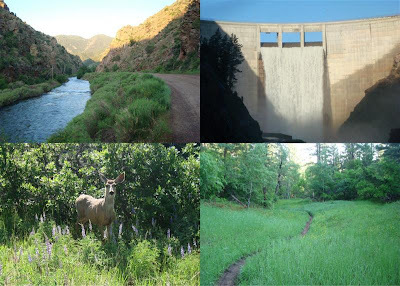 The course was beautiful as we ran the first 17 miles down the Poudre (sounds like "pooper") Canyon right next to the Poudre River. The final 9 miles meandered through a small town named Laporte before ending in Old Town Fort Collins. I needed a 3:15:59 to qualify and with a little help of some downhill running, I was able to finish in 3:09:43. The downhill was nice on the lungs, but for the first time I experienced minor leg cramps from about mile 3 on. It wasn't bad, but it had me more than concerned that it was going to unleash at any moment. The day started with my alarm going off at 3:00am. The hotel we were staying at had buses waiting outside to drive us the 26 miles to the start. Those buses left at 4:00am. Thankfully they opened the Starbucks stand in the hotel lobby at 3:45, so I was a happy guy for the 50 minute ride. When the buses arrived at the start (a campground in the canyon), we had a good hour and fifteen minutes until the race started. It was 35 degrees outside and pitch black. Thankfully we were able to stay in the bus for about 35 minutes before we got kicked out into the cold. Once the race started at 6:15am, I just focused on making it to mile 17 which was the first spot spectators were allowed on the course. I was very excited to see my three favorite ladies! They did not disappoint. Loud cheers, cowbells & signs! What more could I ask for in getting a needed boost. Everything went great until mile 24. I had a little encounter with "the wall", but somehow managed to hold it together enough to only lose a few minutes due to much slower running. I took this shot on a recent morning run. 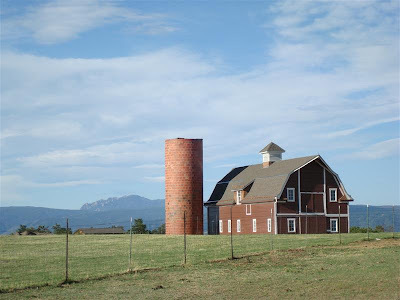 This barn is close to Daniels Park. Sunday is the Colorado Marathon. I'm excited and ready. I need a 3:15 to qualify for Boston, so check back Monday to see if it happened. Last Sunday was the London Marathon. It's one of the more popular ones. Apparently, if you want to get into the Guinness Book of World Records, this is the marathon to run. They have officials on the scene to verify any "record breaking" accomplishments. Here are a few recent ones. Enjoy! * Fastest marathon on stilts (8hr 25 min). Saturday was a run in the snow, and Sunday was a tune up half marathon. Many training schedules encourage you to fit in a 10K or half marathon to help work out some of the nervous energy and practice your pre-race routines before the marathon. The Platte River 1/2 was an excellent race. I'd highly recommend it to anyone looking for a well organized event and fun course. It began in downtown Littleton, followed the Platte River Trail, and finished at Denver's "oldest restaurant", the Buckhorn Exchange. I ran with Scott, who is in training for the Steamboat Marathon in June. We ran together and had a great time. We hit the pace we wanted while chatting most of the way. It sure made the time go by fast. When we reached the finish, awaiting us was the best post-race indulgences. Burgers, beer and breakfast burritos! I partook in the two latter items...I know...quite the combination. Actually, it was my first post-race beer ever. Typically, that would be the last thing I wanted after running...or at 10:45 in the morning! 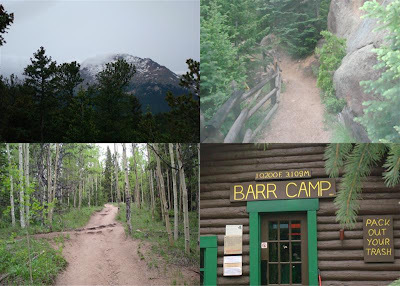 I chose REI as my runabout destination for two reasons. 1. They have cool stuff to look at. 2. They have a Starbucks. It took me about 3 hours to get the 20.5 miles from HR to downtown. 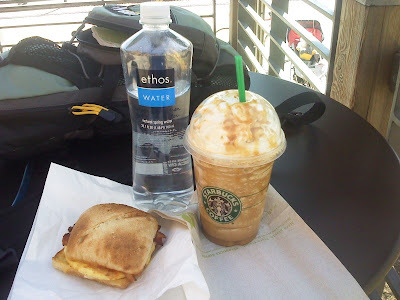 I did eat a bit before I left, but I was quite hungry when I entered Starbucks. Before I could indulge in what you see above, I had to visit the restroom to wash my face. Unfortunately, running long distances produces a lot of sweat that dries to a nice white salty powder on my face. No need to give a ghostly scare to the other patrons trying to enjoy their morning coffee! After my snack, I walked the store a bit. I then made my way over to the 16th Street Mall and found Barnes & Nobles. Forty-five minutes later I was on the light rail beginning my trek home. Upon arriving at the Littleton light rail station, I had to take a bus to HR. The best I could do was get dropped off 2 miles from our house. After sitting for over an hour, my legs had tightened up. That 2 mile jog home was much worse than the 20 mile run downtown! Oh yeah...I don't get Frappuccinos or any other fancy coffee drinks often, but I can say this one was the best ever! I recently read a book called 50/50 by Dean Karnazes. 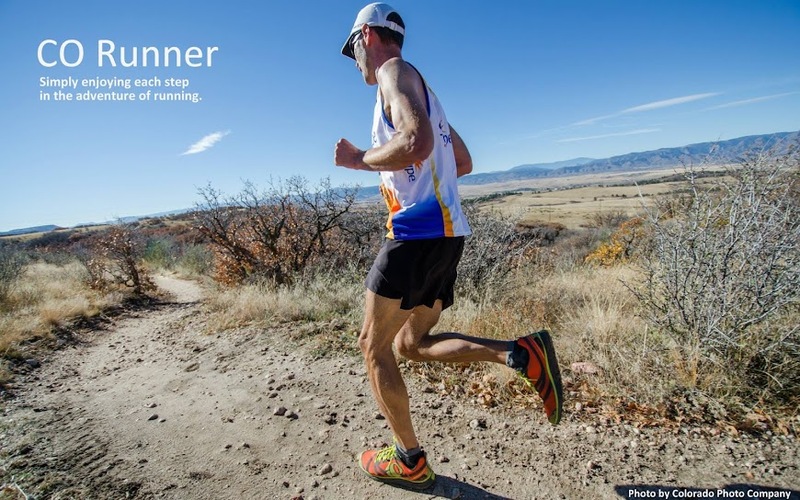 It chronicles his attempt to run 50 marathons in 50 states in 50 days. 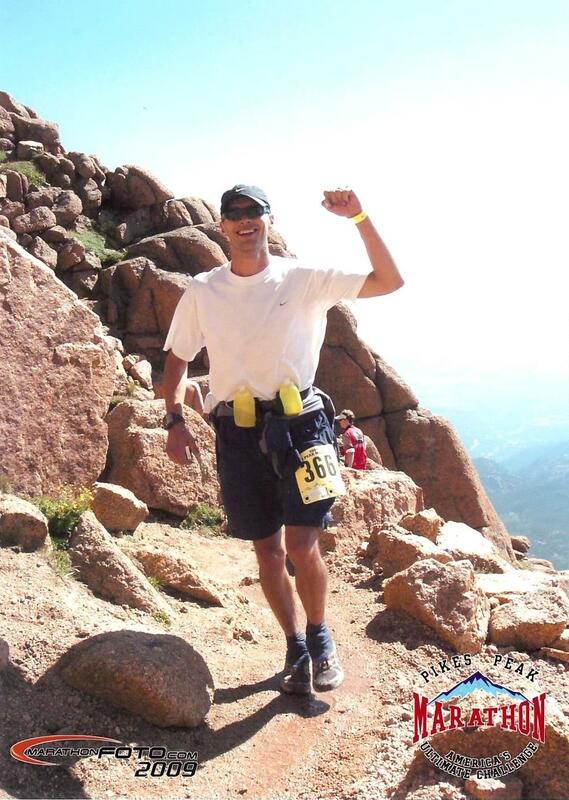 Dean has many other unbelievable running accomplishments that have earned him the nickname "Ultramarathon Man". In 50/50 he offers many tidbits of advice to marathoners. One of them was an idea to break up the monotony of training by going on a "runabout". A runabout (Dean-style) is to grab a cell phone & credit card and head out the door before sunrise and not return until after sunset. Just pick a direction and go. The goal is to continue jogging/walking most of the day. With Tanya & the girls in CA, I decided to go on a runabout (Woody-style) on Sunday morning. I packed up my Camelbak with: 60 oz of Gatorade, phone, wallet, change of shirt, granola bar, and...public transportation schedule! I've learned to be prepared! I left around 8:30am and headed north. My destination? REI in downtown Denver. I didn't realize how much fun this adventure was going to be. It's not that anything out of the ordinary happened. No, the fun part was venturing out on a gorgeous day and just going somewhere by foot that I would never of thought going before without a car. 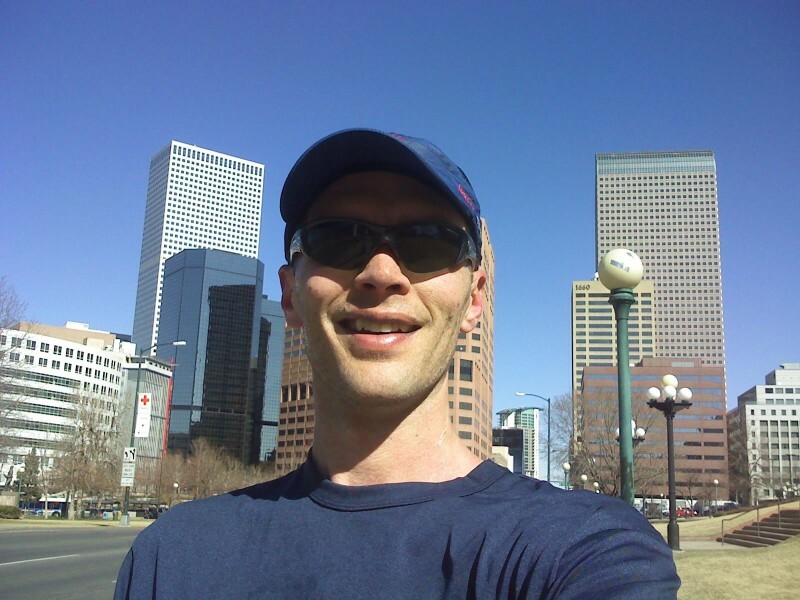 As I got closer to downtown, I weaved my way through Washington & Cheeseman Parks, the heart of downtown, then out to Coors Field, and finally through Riverfront & Commons Parks which brought me to Confluence Park & REI. This past Saturday night was special. In the sky that night was a "perigee moon". This huge full moon lit up the night. Spontaneously, I got an email from James saying we ought to go for a "full moon" run. James is training for the San Diego Marathon in May. His idea was awesome. He came over at 9:30pm and off we went into the backcountry. We hit up some nice trails and marveled at the views of the mountains and city. It was cold, but as you can see, we were dressed well and didn't feel it. 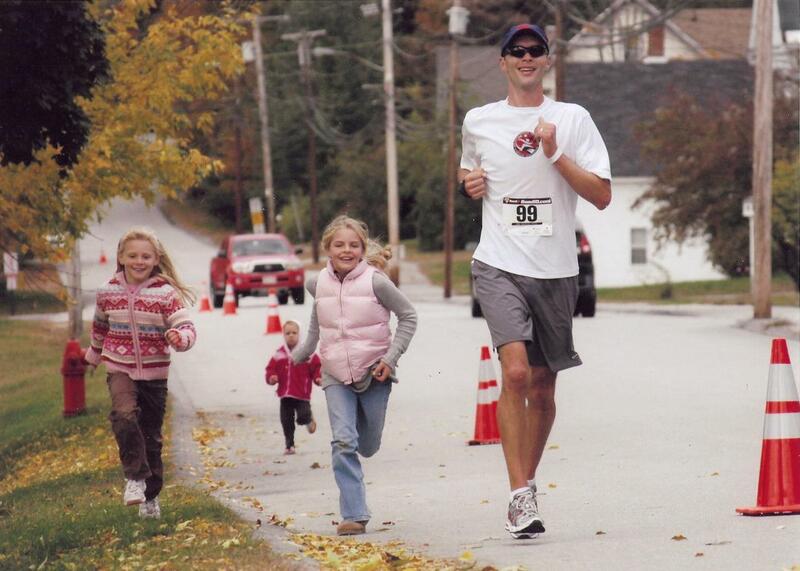 In marathon training, you're supposed to do your longer runs at "conversational" pace. We did just that and 7.5 miles were completed quite easily.